Browse our extensive selection of disposables for restaurants, bars and all other food service and event businesses in need of bulk, wholesale disposable products. Our products range from disposable gloves to bags to paper plates, bowls, cups and more, to plastic cutlery, aluminum foil products, and take out containers. As the #1 restaurant and kitchen supply store in the nation, we guarantee to provide you with top-quality products, lasting durability, and affordable wholesale prices. Why Buy Restaurant Disposables From Round Eye Supply? At Round Eye Supply, we strive to uphold our goal and that is to become the nation’s one stop shop for all your restaurant supply and equipment needs. As a top supplier of restaurant supplies, we understand restaurant disposables are a must in the industry today. Whether you are a food service business that accommodates outdoor or indoor events, disposable restaurant products are essential for your day to day operations. We are continuously adding more and more restaurant disposables to our inventory list every day. Here you will find our extensive list of quality disposable restaurant supplies all at great low prices. 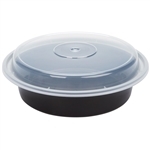 This includes take out hinged lid containers which comes in a range of different sizes, brown paper bags, napkins, plastic utensils and disposable cutlery, paper and foam plates, plastic drinking straws, food wraps and more. Not only do we carry disposables for your carry out and tableware needs, we also supply disposable cookware and kitchenware. Behind every successful restaurant business, there is a messy kitchen with mile long stacks of plates and utensils. As a restaurant supplier, we identify with our customer base and try to simplify the workload for all restaurant owners. Using our disposable cookware items such as the aluminum foil pans, eases the clean up process by cutting down on time and saving you more of it to allocate your focus on other restaurant tasks. We believe high quality and low prices should go hand-in-hand when purchasing wholesale restaurant supplies. Never compromise on quality when on a tight budget. Rely on Round Eye Supply’s premium disposable restaurant supplies at affordable wholesale prices delivered right to your door.